Board and Train in Denver. Obedience and manners. Are you headed out of town and want your dog to upgrade his manners while you’re away? Or perhaps you have limited free time, and you’d like to contract the job out to an expert? Or maybe your dog just needs a training refresher. Pavlov can help with Board and Train Camp! Why Pavlov? There are a number of special aspects to Pavlov’s Board and Train Camp. First, your dog will be trained in your dog trainer’s home. He’ll receive training walks in a residential neighborhood similar to yours – think pedestrians and neighbors walking their dogs. Many training facilities are located in areas zoned for industry or agriculture…not residential. Consequently, they do not offer the same opportunities for training in an environment with dog walkers, joggers, cars, squirrels. Your dog will train in an environment that is similar your neighborhood. Second, your dog’s day will be filled with structured walks, training sessions, and free time to be a dog. Your dog will benefit from social time with other dogs as well as individual attention. Finally, Pavlov’s training approach is a healthy hybrid of traditional training and positive reinforcement. Consequently, your dog will excel quickly in learning new skills and stopping unwanted behaviors. Obedience Lessons – walk politely on a leash, heel (walk to the left of your hip, stop when you stop, start with you stop), whoa (slowdown), parallel sit, sit/stay, come, no (stop doing that). Self-Control Lessons. Food bowl stay, front door stay, crate manners. Inhibition Training. Correct incessant barking, jumping on people, jumping on counter tops. Respect personal space. Field trips to hiking trails and public parks. Video updates twice a week, so you may admire your dog’s progress, and begin learning how to maintain the good stuff. Two private lessons to help you maintain your dog’s polite behavior, and one year of trainer support. See agenda items above. Solid training for all lessons inside, and on a leash outside. 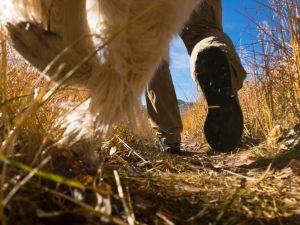 Take your dog’s training off leash, outside, and around real world distractions. You and your dog will learn the skill of humane electronic collar training – the responsible and SAFE way to have your dog off leash. Excellent program if you’d like to bless your dog with off leash freedom on the hiking trail! All Pavlov Board and Train Camps are $1200 per week. Programs are generally two – three weeks. A $400 nonrefundable deposit is due at the time of booking. The remainder of the first half is due at drop-off, and the second half is due at pick up. How many campers are enrolled at a time? No more than three. We limit enrollment to focus on high quality, individualized training. Where will my dog rest? In a comfortable crate, in a bedroom inside your dog trainer’s personal home. How long is camp? Most programs are two weeks. Puppies and dogs who are green to training are welcome to enroll in On Leash Obedience camp. Off Leash Obedience requires that your dog be at least six months old, and must have a foundation of training. Foundation meaning, your dog has completed an on leash program (obedience level 1) with Pavlov or elsewhere, or your dog is 70% responsive to commands in a low distraction venue like your home, or is equally responsive in the presence of food. If one of these does NOT describe your dog’s foundation of training and you’d like him to advance through both on leash and off leash programs, we’ll need a three week program. What is the ratio of dogs per dog trainer? There are 3 dogs per 1 dog trainer. 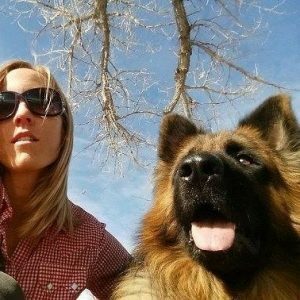 Industry standard in Denver is 12-15 dogs per dog trainer. Consequently, your dog will benefit from more time with your trainer. Can I dictate training methods, or put restrictions on my dog trainer? No. Is this a superior program? Yes. Pavlov was voted Best Training on Denver A-List. We’re the most reviewed dog training company in Denver on Yelp and Google. Why these agenda items? Pavlov specializes in family dog training. Curriculum is designed to encourage a grounded head space, and while the agenda has been tweaked over the years, we believe the current agenda provides the most return on investment. Aggression. My dog threatens people or dogs when he is off leash. Is board and train a good program to address this issue? No. Camp is not designed to address threatening behavior, fears, or phobias. Reactivity on leash is not considered aggression. While campers do not have to make friends, it is important that they peacefully coexist. Can I purchase additional camp days? Yes. What is the price? $1200 a week. My dog completed a training program with Pavlov, and I want board with a trainer who will insist on polite manners, and not comprise previous training. Is this an option? Yes, this is called Boarding with Benefits. Benefits includes: maintaining house manners, socialization with other campers (for dog friendly dogs), correcting naughty stuff as it arises, and living in a cozy home. No more coming home from vacation to find that your dog has practiced naughty behavior! Price is $80 per day normally, and $100 during peak times. Where is Pavlov located? South West Denver. How can I discuss which training options are best for my dog? Fill out the Board and Train Application. Afterward, we will contact you by phone.